The number of Boomers and retirees who are hungry this holiday season is staggering…and growing. “Food insecurity.” What does that mean? Through a charitable outreach earlier this month, I received a request to make a contribution to a large state university. It wasn’t for the new football stadium or for the capital campaign or even for scholarships. It was to support the one in ten students who don’t have enough money to pay for a meal plan and are going hungry while trying to better themselves through education. That means 2,800 students at this one campus don’t have the means to know where their next meal is coming from. Frankly, I was stunned. Is it just me? With both of my girls in or just out of college, how did I miss that not every kid on every college campus is getting enough food? Typically, these are students from low-income families who are paying their own way to earn their education. They are often the first in their family to attend college and they are working while going to school. But the harsh reality is that between tuition, fees, books and rent, there simply isn’t enough left for meals. On the heels of that request, I received a year-end appeal from the AARP Foundation. This is a charitable affiliate of the AARP. They focus on assisting anyone over the age of 50 (that’s us Baby Boomers!) that is struggling financially and cannot meet basic needs. The Foundation directs its resources into four specific areas; the first one is hunger. The numbers are staggering. “Nearly 9 million Americans over the age of 50 have been left hungry by the recession,” states the Foundation’s fact sheet. 9,000,000. 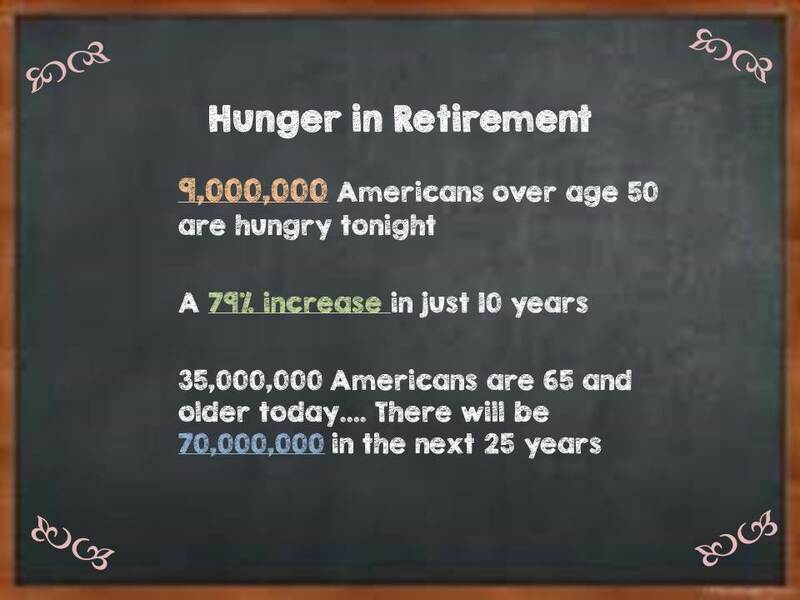 That is a shocking number of those 50 and older and many retired people who face food insecurity and are in need of the assistance provided by the Foundation’s “Drive to End Hunger” initiative. Separately, the Feeding America Network (this organization provides support for anyone at any age in need of meals or food assistance) tracks the sheer number of individuals served through one of their 58,000 programs across the country. In 2014, “One in seven Americans turns to the Feeding America network for food assistance,” is a frightening statistic from their website. That’s some 46.5 million people in the U.S., including 12 million children and 7 million seniors. When we think about our own retirement and all of the positive and exciting new adventures we’ll experience, I’m quite sure that hoping there will be adequate food on our table is not part of the dream. 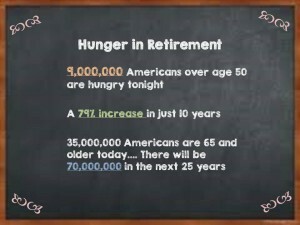 When I see these staggering numbers in the millions of those hungry in retirement, it’s hard to even grasp. How can we both prepare for the realities of being retired (meaning, losing that paycheck from an employer) and help deal with a very real and growing problem among the aging population? There are some 35 million people in America who are 65 and older today. That number is projected to double to 70 million over the next 25 years. We can speculate that the growing ranks of elderly with food insecurity will also double. Think of it this way: if we have some 30 million seniors lacking for adequate food, that group’s population would be larger than any one of the 50 states except California. Only California is larger with a population of around 38 million. When looking at the median household income for families needing assistance, it is $927 per month (according to Feeding America). Interestingly, the average monthly income from Social Security for women is $1,043 and for men is $1,366 (data for 2013). I bet there is a really strong correlation between the lower end of Social Security beneficiaries and the need for food assistance. But, food insecurity can strike so many people in every kind of community. So, we’ve been providing a food pantry for the last 84 years in our little community. The first Feeding America food bank began in 1979 and has grown to an operation of 200 networked banks across the country. That’s 35 years of service across the country. Since launching in 2010, the AARP Foundation has served some 30 million meals. And, there are many, many other local and regional food pantries and Federal programs as well. The point? We’re coming up on nearly a century of supporting fellow Americans, especially children and retirees, who cannot afford enough food for the week. Many boomers and seniors find themselves, after years of providing for their families, unable to support themselves sufficiently once that paycheck stops. How is it that we’ve made tremendous technology and medical advances over this same century, yet we aren’t even close to solving the hunger problem in America? It never takes America 100 years to solve anything. Why haven’t we solved the hunger crisis in our own backyards? Sadly, I don’t have any brilliant solution to offer. It just struck me at this time of year when there is such celebration and abundance that a growing number of our retired citizens do not have plenty. The problem seems quite insurmountable. Can any of us even make a difference? I’d like to think so. So, during the holiday season this year, I’ll just do my best to help at least a few retirees find a bit more joy. I might make a delivery of holiday treats to our local food pantry or send a donation to help feed our retired citizens. Small acts of kindness at this time of year can make a bigger difference than we may realize. Wishing you and yours a season of peace, hope and charity.